Hartlepool United's 96-year stay in the Football League ended as they were relegated despite battling back to beat Doncaster Rovers, who missed out on the League Two title on the final day. Two Devante Rodney goals looked to have kept Hartlepool up, but Mark O'Brien's late winner for Newport County in their game saved the Welsh club instead. Andy Williams had put Rovers ahead before United's stunning fightback. But O'Brien's 89th-minute Newport goal sent Hartlepool to the National League. Needing to win and hope Newport failed to beat Notts County to survive, Hartlepool's decisive day began badly when James Coppinger's first-half cross was eventually turned in by Williams from close range as defender Carl Magnay sliced his clearance. With Newport winning at that stage, Hartlepool looked doomed, before an equaliser for Notts County at Rodney Parade lifted the Teesside club. And Hartlepool's hope turned to ecstasy as 18-year-old substitute Rodney slotted in his first two senior goals in quick succession to temporarily lift United above the drop zone. But, as the game moved into stoppage-time, news of Newport's late twist brought despair to the Victoria Park faithful. Defeat saw already-promoted Doncaster, who had needed to better Plymouth's result to finish top, fail to capitalise on Argyle's draw and they eventually finished third, as Portsmouth leapfrogged both their rivals to win the title. While an extraordinary finish at Rodney Parade was ultimately what sent Pools down, their undoing began much earlier in their campaign. Hartlepool had won just two of their past 10 games when manager Craig Hignett was sacked in January after 11 months in charge. Despite that poor run, Pools were seven points clear of the relegation zone when they named former Wolves, Sheffield Wednesday and Cardiff boss Dave Jones as their new boss - an appointment that was described as a "no-brainer" and "a real coup for the football club". But just 13 points were taken out of a possible 51 in his disastrous 17 games in charge, leaving Pools two points adrift of safety when he was dismissed on 24 April, less than 48 hours after club president and Sky Sports presenter Jeff Stelling issued a message for Jones to leave during a live television broadcast. Defender Matthew Bates was placed in charge for the final two games of the season, with striker Billy Paynter and coaches Stuart Parnaby and Ian Gallagher forming the rest of a makeshift coaching team. 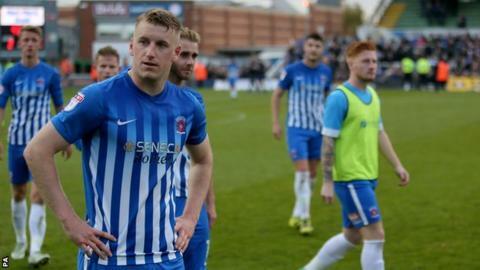 But, after losing at then-relegation-rivals Cheltenham on the penultimate weekend, they were unable to stop Pools dropping out of the EFL for the first time since 1921. "I was trying to keep a level head but it was difficult with the results coming in. "There was nothing wrong with the performance. They went 1-0 up and we had to regroup, but we did and came back at them. "It was all positive in the dressing room at half-time. The shackles were off and there was no pressure so make yourself heroes. "We needed to get the fans onside and we did with our performance. I have learned if you give the fans everything on the pitch they will stick by you. "We got relegated but the fans stayed behind and clapped us off they showed their appreciation but ultimately is that right or wrong? "The players have been magnificent in the past two weeks. It has been humbling." Match ends, Hartlepool United 2, Doncaster Rovers 1. Second Half ends, Hartlepool United 2, Doncaster Rovers 1. Corner, Doncaster Rovers. Conceded by Nicky Deverdics. Attempt blocked. John Marquis (Doncaster Rovers) right footed shot from outside the box is blocked. Hand ball by Brad Walker (Hartlepool United). Joe Wright (Doncaster Rovers) is shown the yellow card for a bad foul. Foul by Joe Wright (Doncaster Rovers). Corner, Doncaster Rovers. Conceded by Carl Magnay. Corner, Doncaster Rovers. Conceded by Lewis Hawkins. Foul by Devante Rodney (Hartlepool United). Joe Wright (Doncaster Rovers) wins a free kick in the defensive half. Devante Rodney (Hartlepool United) wins a free kick in the attacking half. Foul by Andy Butler (Doncaster Rovers). Attempt missed. Andy Williams (Doncaster Rovers) right footed shot from outside the box is close, but misses to the right. Gary McSheffrey (Doncaster Rovers) is shown the yellow card for a bad foul. Goal! Hartlepool United 2, Doncaster Rovers 1. Devante Rodney (Hartlepool United) right footed shot from the centre of the box to the centre of the goal. Assisted by Padraig Amond. Carl Magnay (Hartlepool United) is shown the yellow card for a bad foul. Foul by Carl Magnay (Hartlepool United). Tommy Rowe (Doncaster Rovers) wins a free kick in the attacking half. Substitution, Doncaster Rovers. Gary McSheffrey replaces Craig Alcock. Goal! Hartlepool United 1, Doncaster Rovers 1. Devante Rodney (Hartlepool United) right footed shot from the centre of the box to the bottom right corner. Substitution, Doncaster Rovers. Aaron Taylor-Sinclair replaces James Coppinger. Substitution, Hartlepool United. Connor Simpson replaces Rhys Oates. (Doncaster Rovers) wins a free kick in the attacking half. Corner, Hartlepool United. Conceded by Ian Lawlor. Attempt saved. Brad Walker (Hartlepool United) right footed shot from the centre of the box is saved in the bottom left corner. Carl Magnay (Hartlepool United) wins a free kick in the defensive half. Foul by Matty Blair (Doncaster Rovers). Foul by Padraig Amond (Hartlepool United). Andy Butler (Doncaster Rovers) wins a free kick in the attacking half. Substitution, Hartlepool United. Devante Rodney replaces Nicky Featherstone. Corner, Hartlepool United. Conceded by Craig Alcock. Foul by Craig Alcock (Doncaster Rovers). Corner, Hartlepool United. Conceded by Andy Butler. Substitution, Hartlepool United. Nicky Deverdics replaces Michael Woods.